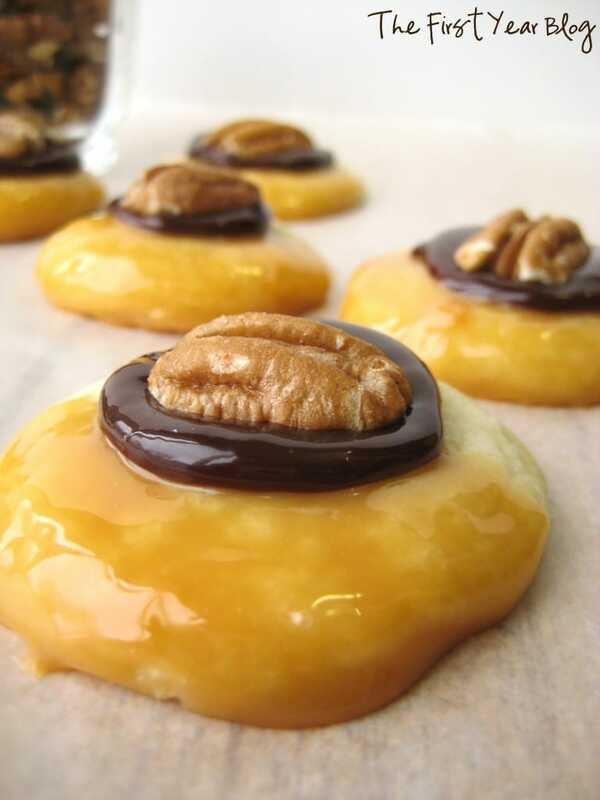 This is a fun twist on chocolate covered turtles! 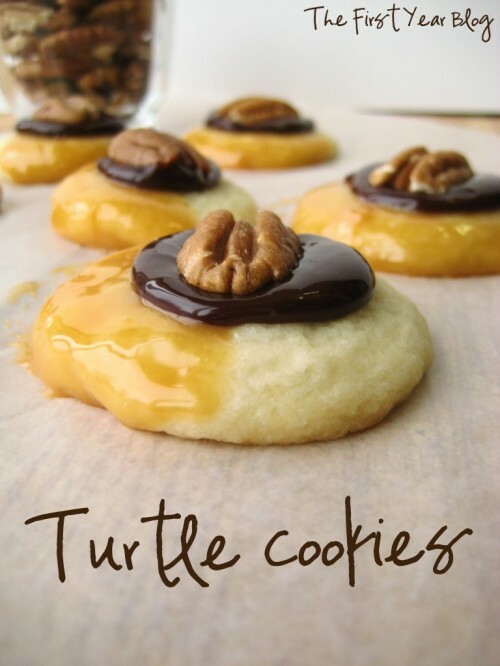 I had the privilege of sharing these turtle cookies over at Alderberry Hill earlier this week. Preheat the oven as directed on the sugar cookie box. Prepare the sugar cookies as directed on the package. Roll dough into 1 inch balls, placing about 2 inches apart on parchment paper. Bake for 11-12 minutes or until they begin to turn golden. 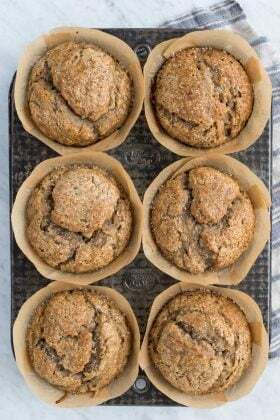 Allow them to cool completely. Unwrap the caramels, place them in a microwave safe bowl along with the milk and microwave on high for 1 minute, stir. Continue to microwave in 30 second intervals until the caramel is smooth. Dip one side of the cookie into the caramel, allowing the access to drip off before placing on wax paper. Reheat the caramel as needed. Allow the caramel to cool and set (but it will still be gooey) before adding the hot fudge. I actually added the hot fudge the following day when I made these. Heat the hot fudge in the microwave until melted. 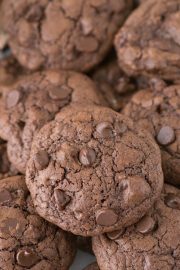 Using a teaspoon or 1/2 teaspoon depending upon how large your cookies are, add the hot fudge to the center of each cookie. Place a pecan half on each cookie before the hot fudge sets. I found it best to store these in the refrigerator to prevent the caramel and hot fudge from becoming runny. What?! The pecan is the best part! Thanks for coming by Erin! What fun these cookies are, TRUE! Love the staging of your photo too! Viewed as part of Foodie Friends Friday Party! Thanks for coming by Joanne!! Wow! 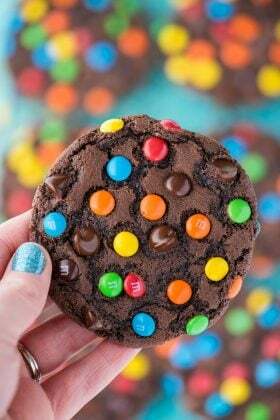 These look soooo amazingly delicious! Can I come over? lol. Thanks for sharing at Shine on Fridays. Your photos are fantastic. Sure, come on over! Thanks Amy! They look amazing! 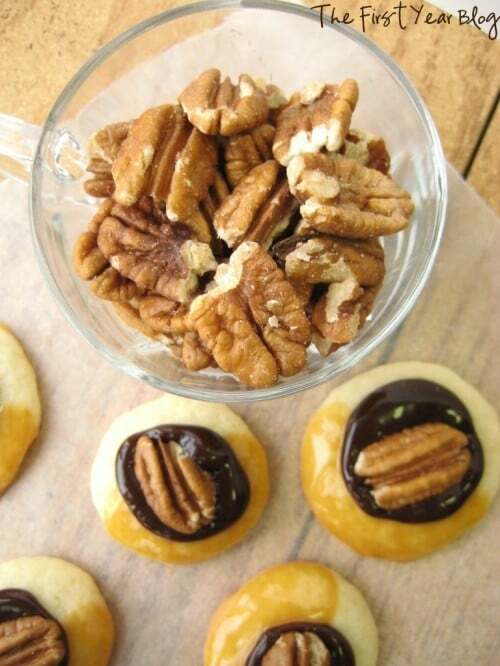 I love anything with pecans so these are getting pinned right now! If you have a minute to spare I’d be thrilled if you could share this post at my weekly Say G’Day linky party-it would be a perfect addition! This sounds delicious! Thanks for sharing!! 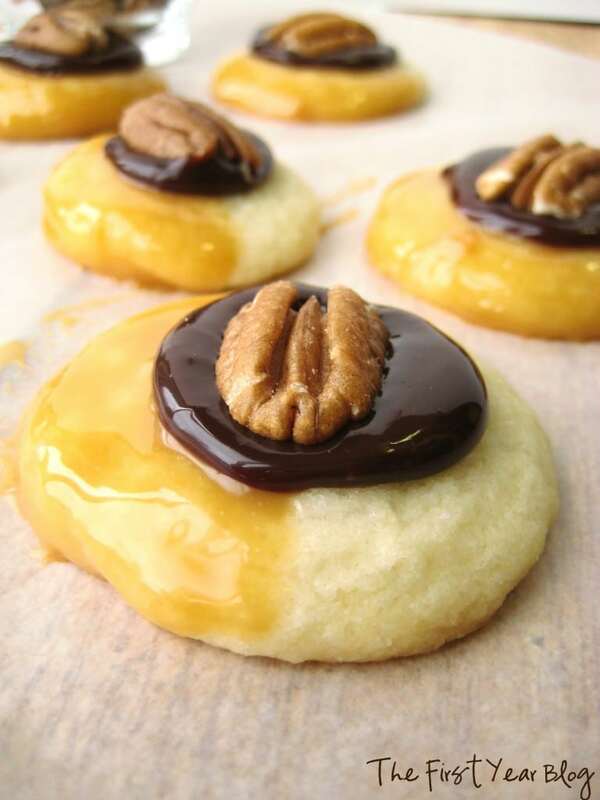 I would love for you to share these cookies on my blog link party, Sweet Tooth Tuesdays. Hi Sarah! 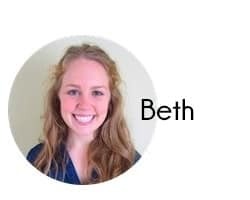 I am stopping by to link up! Thanks my friend for taking the time to come by! These cookies look wonderful! Thanks for sharing on Foodie Friends Friday! Oh my, these look super yummy! I’ve pinned them. Thanks for linking up at the Weekly Creative! Coming by to share ’em! Pinned and shared on Google+ today ! Beth, these look like they can be quite addictive ;-) Thank you for linking this to our ALL MY BLOGGY FRIENDS party ! Oh goll, thanks for sharing them Linda!! These cookies are making me hungry! Love the flavor combinations. Pinned and Zipped it. What a great little cookie!!! 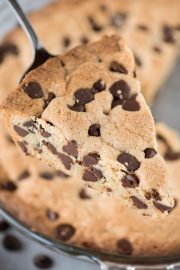 The ingredients must make this an easy cookie to make quickly!!! 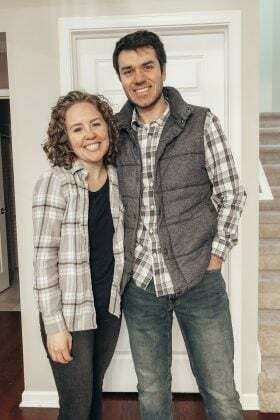 So glad to have found you through Give Me the Goods Monday link party! You are right Amy, easy peasy! These look so yummy! Pinned. Thanks so much for sharing on Busy Monday! Oh My! I think I could eat these by the dozen! They look so yummy! Thank you for linking to the In and Out of the Kitchen Link Party! I look forward to seeing what you bring next week! Thanks for link up to Sweet Tooth Tuesdays! 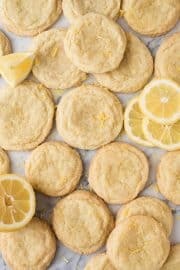 These yummy cookies are one of the features I’m sharing this week! You can stop by and grab your featured button, if you want. I’d love it if you would link up again this week, I can’t wait to see what everyone shares.